Approximately 200 attended the 50th Anniversary Luncheon, Friday November 10, 2017 at the Baker Conference Center on the campus of Lubbock Christian University. 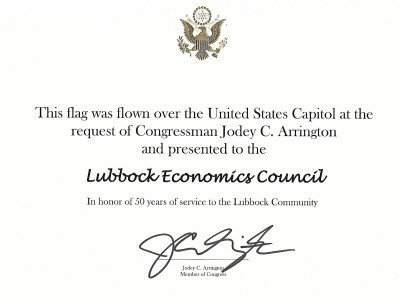 Congressman Jodey Arrington offered gracious congratulatory remarks and presented the flag at left to the LEC to mark the occasion. (Left) Lubbock Mayor Dan Pope introduces the event's keynote speaker, former state senator and Texas Tech Chancellor Emeritus John T. Montford. (Below) John Montford delivers remarks on the past and the promise of the South Plans economy. "outstanding contributions in public service, higher education, and economic development for West Texas." Left: Chancellor Montford with LEC President Russell Dabbs. LEC President Russell Dabbs; Lubbock Mayor Dan Pope; former Texas Tech Chancellor John T. Montford; Steven Lemley, former President of Lubbock Christian University; and L. Timothy Perrin, President of Lubbock Christian University.